I've really gotten spoiled by the Matchdot II sight on my Model 41. It is so easy to tell where the gun is aimed. 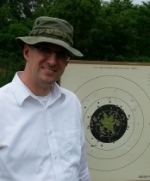 Yesterday I went back to the range with my Les Baer 45. To improve accuracy, the sights have a very narrow slit between front and back as you hold the gun in front of you. It's great for aiming, but the black sights on a black target makes it difficult. One option would be to paint (or use fingernail polish?) on the sights. Or, to just learn how to deal with it. I was wondering last night if people in Bullseye typically color the sights (white? red? yellow?) or leave it as-is until they're eventually comfortable with it. I was wrong when I thought that learning how to shoot a .22 would help me shoot better with a .45. The .45 exaggerated everything I was struggling with on the .22. On the other hand, because of working exclusively with the .22, I was able to identify things that I was doing wrong using the .45, and get them under control. At least that's what I thought until I put up a solid black B-8 target. That's what led to the question up above. Rob, if I only shot at one target, that would work, but I shoot at many targets. B-8 is what the club uses, but in practice, I usually shoot at something very small. Or, whatever people I'm with are shooting at. Yesterday the goal was to put 10 shots into a 1 1/2" diameter black bull at 15 yards. My groupings were mostly two inch diameter. One of my friends suggested I use white typewriter correction fluid on the sight. It's easy to clean off it it doesn't work out. I will try that. I understand what you wrote about what I should be "looking at", but thanks to my cataract surgery, and shooting glasses, the only thing that is sharp in front of me is the front sight. What's harder for me to see, is that there is an equal space on either side of the front sight, so I know it's centered in the rear sight. What I do, is 100% concentrate on that front sight blade only, and let my sub-conscious worry about the equal spacing thing. Thanks to all the advice up above, I've got a lot of good ideas to work with when I get home. Thanks!! mike meyers wrote: What's harder for me to see, is that there is an equal space on either side of the front sight, so I know it's centered in the rear sight. This is why you want a wide enough notch for the rear sight. Here's what Don Nygord had to say and its good. 'jmdavis', that might be very good generic advice, but for my eyes, it doesn't "fit". "There is a good reason for this: as the eyes ages, the efficiency of the rods and cones in the retina declines — making it more difficult to discern the boundaries of the front sight and the rear notch. The wider sights “fire” more of these receptor cells and give the brain more information." As of today at least, who knows what the future will be, with the exception of my cataract repair, I see very well. If a painting is just slightly tilted, it bothers me. Back to guns, I have a Taurus with a much wider gap in the rear sight, and I can't tell if the front sight is centered or not. 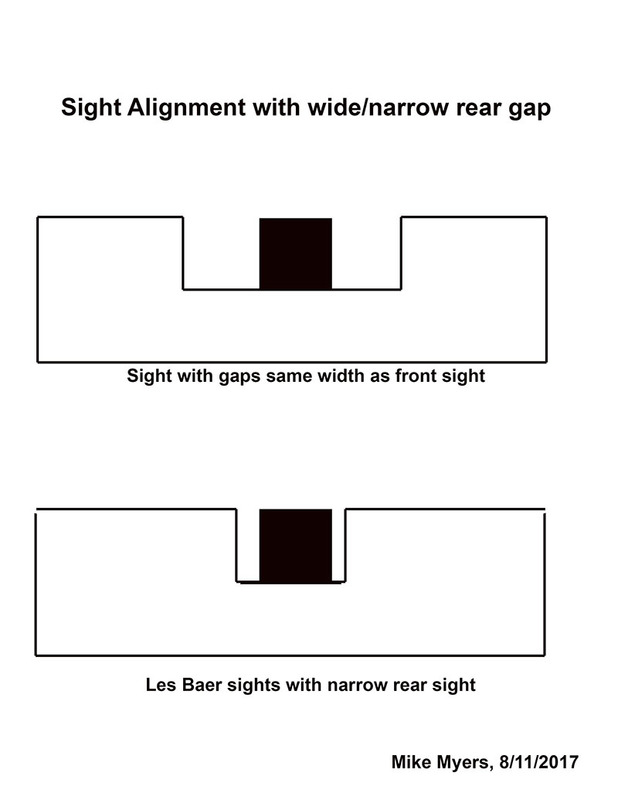 With my Les Baer sight, with the narrow slits, it becomes "obvious" to me (when I can see the gap at all). My own experience at this until now has been the opposite of what this fellow wrote. I guess my eyes/body/whatever are just wired differently than most. Thank you for the advice - I think I will go to the range with the LB next week, and bring along another full box of Winchester White Box ammo, standard loads, and try a few things. I'll bring the white correction fluid, once I'm certain I can remove it easily. The range has fluorescent lighting behind all the shooting positions, and maybe if I turn one of those on, it will illuminate my sights better. mikemyers wrote: 'jmdavis', that might be very good generic advice, but for my eyes, it doesn't "fit". OK the way I read that it exactly applies to you. The article is referring to the rear sights and a wider gap is easier with aging eyes. If you are trying to determine on the difference in the gap you are not focusing in the right place - the front sight. Your subconscious will align the gap naturally, but it has to be able to see it. You can have a wider front sight if you prefer it but then you need to widen the gap on the rear sight too. If you are shooting at 15 yards, maybe the bull is still in too good a focus compared to farther out bulls. You eye must see clear as day and focus as best it can on the front sight. And stay there. Lighting on the sight and at the target can make a difference. Then there is the gap with the rear notch. Also the depth of the notch. Deeper helps me. Make that rear sight a window to best see the front sight. Are your alternate target bulls at least scaled to the proper targets at proper distance. If I recall you use 2 hands. Your eye no doubt would be closer to the sights than most one handers. That might make a difference in focus and the need for notch size adjusting. I may not have explained things correctly. For you, most probably, you can focus on the target, or the rear sight, or anyplace in-between (or closer). That is enabled by the way the lens in your eye does the focusing as needed. For me, the natural lens in the eye (which developed a cataract) has been replaced with a plastic lens (an IOL, short for intraocular lens) which has a fixed focus. My shooting glasses have a prescription so they can focus specifically on the front sight. That means however blurry the target or rear sight may or may not be, it will always be that way. Making a mistake on the trigger press will probably result in a huge error. Making a mistake on the sight alignment - ditto. Making a 1/2" mistake in my aim will put the bullet hole 1/2" off. My brain won't allow me to concentrate on more than one thing at a time. I was given what I think it excellent advice, to concentrate now on the trigger press. My subconscious is trying to focus on the front sight, regardless of what may be a very blurry target, and to keep the sight alignment correct. I have other guns that have a wider "gap". I will try them, and see if I think it helps me or makes things worse for me. I may call Baer Custom, and ask if I can buy another rear sight with a wider gap, but I think I know what they will tell me. More about this later. (Maybe part of it is someone liking what they're used to. If you guys are used to a wider gap, that makes perfect sense. I'll bet you an electronic cup of coffee that Baer is going to tell me the narrower gap is better. Maybe they just made a mistake.... I'll find out). Added a little later - I just got off the phone with Brenda at Baer Custom, and she tells me that for the best accuracy, leave the rear sight just the way it is now. Just curious if you asked Brenda for her competition experience? Is she Distinguished? how many decades of competition does she have using iron sights? People with decades of competition have put forth ideas to help you based on what they have done due to eyesight fade but you want to go with the one person with unknown experience because it is inline with your thinking. You cannot have precision if you cannot discern equal light on both sides of the front sight, that is why we widen the rear sight gap. It works. You won't try to change your sight picture, you won't change your rear sight, I don't get what you will do to improve? how about a thinner front sight? I don't like them, some do. I prefer the look of a thicker front sight and a wider deeper notch. robert84010 wrote: Just curious if you asked Brenda for her competition experience? Is she Distinguished? how many decades of competition does she have using iron sights? People with decades of competition have put forth ideas to help you based on what they have done due to eyesight fade but you want to go with the one person with unknown experience because it is inline with your thinking. You cannot have precision if you cannot discern equal light on both sides of the front sight, that is why we widen the rear sight gap. It works. I concur. Don't ask for weight loss advice from 500# person and don't get shooting advice from unknown shooter. Masters are masters for a reason. mikemyers wrote: Added a little later - I just got off the phone with Brenda at Baer Custom, and she tells me that for the best accuracy, leave the rear sight just the way it is now. they would! (I have 4 of them). That's almost like saying "hey those fixed rear sights were adjusted at the factory, no need to change them"! Oh and don't touch the trigger it's perfect! The bullseye guns they build are OK but I would never look to Les Baer to tune my Les Baer Wad or Hardball guns for bullseye shooting. Many free pistols and quality air pistols have adjustable gaps on the rear sights, there must be a reason for that. In fact that's how I found out I shot better with the wider gap, playing with the gap on my Steyr LP10e. Then I modified a S&W Model 14, a 22 conversion, and my LB hardball gun. In all cases my SF scores improved 3-5pts and my sustained fire scores stayed the same or improved slightly 1-2pts. I agree with Jon! And the worst advise you can get is from someone that does not shoot competition. A guy that made Master did so with a lot of effort, listened to advise of top shooters and applied it to himself. Be careful on what you read or see online. If it's not written by a top or former top shooter ignore it! Just a bit ago I seen this flag saying do this simple trick and you will shoot great scores, naturally interested I clicked on it. They showed a 50 yard target that can be easily shot once this method is applied. That target was better than any high end target pistol can do, I would be very happy if my gun could group that well when shot from a machine rest!! I didn't get much farther, simply closed the window! Salesmen are another! I was at NRA Convention and a Kimber salesman was telling me how great the gun was. He shot completion, was on the Army team and continued until he mentioned shooting at Camp Perry. Just out of usual response I said are you Distinguished? He said he was but hasn't shot for a while so he isn't any longer. I thanked him for the gun information and walked away! Salesman BS!! Jon so well put it, don't ask how to loose weight from someone that is 500 pounds! It still wasn't "bad" advice to leave the rear sight alone. Altering your sights is like getting a tattoo. I'd rather shoot 10's with a modified sight than shoot 9's with an original sight. LenV wrote: It still wasn't "bad" advice to leave the rear sight alone. Altering your sights is like getting a tattoo. Les Baer's have no collector value and rear sight can be replaced if you go to sell it. If you are really worried about leaving it original then by a replacement and modify that one. A tattoo is a preference, opening the sight gap really does help aging eyes, for the same reason I now need to use a flashlight where/when I never needed one before. I agree with robert84010 "I'd rather shoot 10's with a modified sight than shoot 9's with an original sight." I've filed the gap of several pistols rear sights. I've had the red ramp milled off an expensive Smith and Wesson PC revolver to just be a strait post. (it's ugly!). I've added white paint to the top of several guns. (again ugly) I shoot deep sub 6 just to see the white in the gaps. Whatever it takes to help. I can shoot a two inch group with my Model 41 at 15 yards. I would be plenty happy if I could get that good with the 45, consistently. I know the gun can do it, and I know I need to start working with the 45 again, but it has mostly been sitting for a year and a half now. When I put the gun away before, my biggest gremlin was trigger control. The purpose of this thread by the way wasn't to find out the best gap in the sights, but to find out the best way to see black sights in front of a black background (bull). 99.9% of what I need to improve is me, not the gun or the ammo. I'm dry-firing several times a day, almost every day, and also using wrist weights to build up strength in my arms. You guys are already "good". Me? I've only shot two matches in my life, and my groupings at 15 yards went from 10" to 8", then 6, and finally approached 2" with my S&W revolver. My groupings with the M-41 are getting to where I've got more "10's" than "9's". I'm getting spoiled by the red dot sights, and have the kit to mount one on my M-52 at some point. Compared to you guys, I'm mostly a "hobbyist" who wants to get better, and I fully believe that I need to get better myself before I worry too much about the gun. mikemyers wrote: The purpose of this thread by the way wasn't to find out the best gap in the sights, but to find out the best way to see black sights in front of a black background (bull). Question: The best way to see black sights in front of a black background (bull). 2) Try using smoke from a carbide lamp to blacken the front sight, it helps with contrast. Sight Black in a can - less effective but works. 4) Use an IRIS it puts everything more in focus, can be distracting for some people. Options outside the "black background" parameter. One important point visual acuity or 20/20 vision does not guarantee perfect eyesight. Although visual acuity testing is very useful to determine the relative clarity of your eyesight in standardized conditions, it isn't predictive of the quality of your vision in all situations. For example, it can't predict how well you would see: Objects that are similar in color and brightness to their background. Side track for a minute... I read this yesterday, and I kept thinking about it last night. When I got up this morning, I tried to dry-fire my LB one handed. Doing that, everything you guys have said makes perfect sense. There was just a "sliver" of light from the gaps, aiming at a white wall. Aiming at a dark surface, there were no more gaps that I could see. Bringing the gun back to me to where I shoot two-handed, it was very different. Again, with the white wall, there were two narrow gaps that were easy to see, and while using my progressive lenses glasses, so the scratch on the front sight was perfectly sharp, it was easy to keep the sight picture correct. I've never fired this gun one-handed. Were that the case, the things you've all been telling me would be mandatory. Hmm, I will try to find the thread on the "Aimtech 1911 grip mount". If it's still available, I'll buy it. mikemyers wrote: Rob, if I only shot at one target, that would work, but I shoot at many targets. B-8 is what the club uses, but in practice, I usually shoot at something very small. Or, whatever people I'm with are shooting at. Yesterday the goal was to put 10 shots into a 1 1/2" diameter black bull at 15 yards. My groupings were mostly two inch diameter. There is NO problem with living the best of both worlds! I have a list of guns with irons and the "come ups" for each gun/ammo/target/distance combination for the hold style that I see best for each. That list is stapled to the inside of my gun box. A come-up on my sheets is the number of clicks from the sights' "bottomed-out" setting. The number of clicks up is the setting I start at every time and I am almost always right on without worry. Rob, making a list like that is a wonderful idea. I followed Tony's suggestion of making a "shooting book" with all my notes, but a list would be much faster. Better than scrolling through a huge number of pages with anything shooting related that I've done/experienced. Right now I'm concerned with only three guns - the others can wait. All I'm getting serious about are the Model 41, the Model 52, and the Les Baer 45. I tried to use photoshop to show sight alignment with a wide vs. narrow gap. Sorry, I can't make the rear sight fuzzy, but anyway, I drew both sight configurations, wide and narrow gap, and then moved the front sight slightly, five "clicks" to the right. See the image below. To me, I feel something is "funny" with the top image, but in the bottom image it's obvious. The gap with the Les Baer is even less than what I drew here. Maybe the reasoning behind the wider gaps is that it's faster?